Created by Gil Hibben for Sylvester Stallone's recurring role as John Rambo, this striking Bowie style fighting knife appeared in the movie Rambo III. A 13" full length tang knife with solid stainless steel bolsters and a surgical stainless steel 8" blade, the fanciful Bowie shows a unique slotted blood groove and a deep double edged hollow grind. This beautiful replica comes with a well made top grain leather sheath stamped with the maker's name--to keep this heavy short sword sized knife steady at the hip a leather thigh strap is included. Although it's a fantasy knife, this Bowie isn't far away from practical. It's a little flashy and heavy for field use, and the deep hollow grind and blood groove do weaken the blade a bit. If you were determined to lug nearly three pounds of steel along with you on a hunting trip, you'd find it capable of even ordinary work. It's almost certainly more knife than anyone but John Rambo would need. Most owners will hang it proudly on the wall. 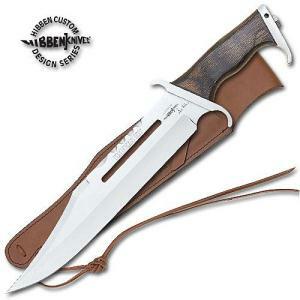 The Rambo knives have become so popular that Hibben's famous designs are frequently copied and marketed as official replicas. The authorized versions are manufactured and marketed only by United Cutlery, and all repairs and warranty issues are handled by UC and not Hibben Knives.